Yay! 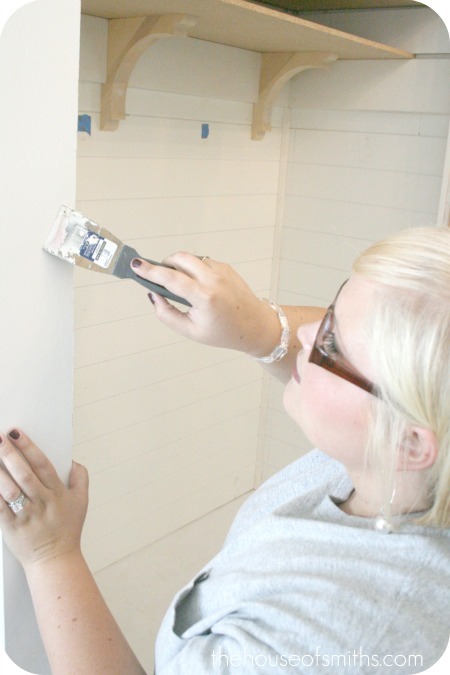 We're back with Part 2 of the "Project Entryway Closet Makeover!" Start at Part 1, if you missed it earlier. YOU SHALL HAVE YOUR FINISHED ENTRYWAY NOOK!!! You know by now that pretty much everything around here starts with a sketch, and this project was no different. We knew that we wanted this space to serve a few different functions. So once we knocked down our walls and measured the space that we had available, we started working up our design plan. First things first, rip up the small patch of carpet and build a platform for the bottom of our nook, along with a bench above it. We did this by building sort of a grid with 2x4's and 3 inch screws, like below. Then we bought inexpensive pieces of 3/4 inch thick plywood, notched out the corners (to make room for the nooks opening) and laid those on top. Once Cason and my Dad had that done I got to work painting everything with 2 good coats of primer. After that was finished we used our nail gun to adhere the bench really well to the 2x4 grid we built earlier. But in the end, after a lot of discussion with Cason, we decided that wallpaper probably wouldn't hold up to the wet coats and "kid traffic" that would be flowing through here everyday, and since we really wanted this space to be durable... beadboard it was! BUT, instead of putting the sheets vertical, I decided to flip them on their sides, so it resembled more of a paneled look. The second I saw it coming together I let out a little squeal because I loved it so much! Next was storage, so a killer-awesome shelf was in need! 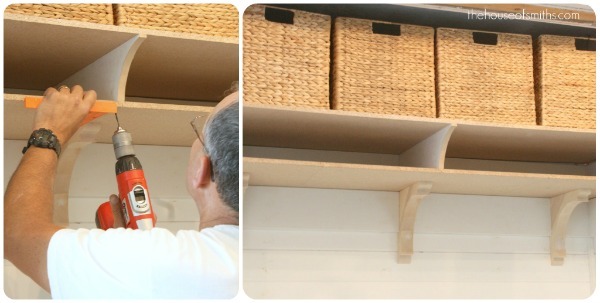 I designed a two shelf system for my Dad to help me build where the top level would be for baskets to house those batteries, extension cords and light bulbs in... and then the lower level shelf would be for wire baskets that would hold kid papers and mail. Instead of just two regular shelves, one over the other at the same level, we scattered them a bit and made these custom dividers. I used the dividers as not only support for the top shelf and sectioning agents for the wire baskets (you can see in the photo below, that without all the dividers the baskets up top would be too heavy and the shelf would droop) but also as a decorative element. 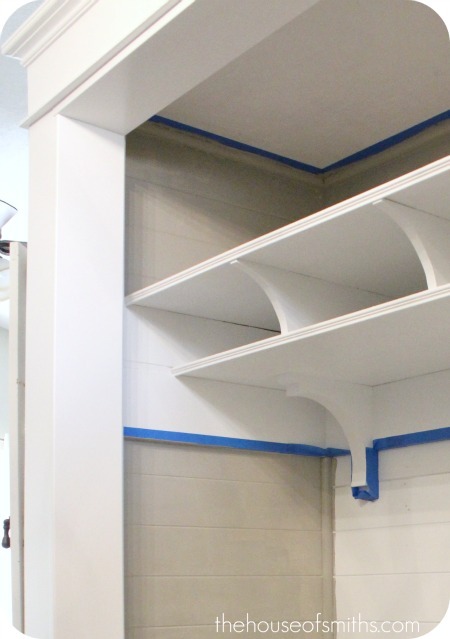 See below, how they mimic the shape of the corbels below on the bottom shelf? ** In the long run the baskets in these pictures ended up being too tall and not working, so I returned them and bought a smaller size. Cason finished off the plywood shelving with decorative trim on the fronts to give the space a more finished, manicured look. So after all was said and done, this is what the shelving unit looked like! Before we started decorating anything we had to finish off the outsides of the nook with some pretty trim. I pre-painted all the trim before hand to cut down on work later, and then my Dad and Cason assembled the top part of molding the way I designed it. It consisted of 3 pieces. A small, thin piece of trim turned on it's side for the bottom, a 4 inch board for the middle rise and then a chunky piece of brick molding for the top, to make a 'crown molding' look. After that was installed we finished off the rest of the nook with boards around the edges. For ME, this is the BEST part! I love the difference finishing details make! Now it was MY turn to really get to work. I filled 2,367 nail holes (wink), sanded down everything and primed it all white. I have to say that this process was DEFINITELY the most time consuming. For the longest time I figured we would just keep the whole nook white, and accent with color, but Cason was obsessed with the idea of having deep grey planked walls in this space... so I went with it! I actually really like the way it makes the white 'pop' and since we're pretty much using the grey and white color scheme in the rest of our projects lately... why not? ha! Alright, so this is about where we are in the processes, minus a few decor items that we've added. It took about a MONTH for me to find the RIGHT fabric for the bench cushion, but I finally decided on that small swatch of grey circle fabric from Dwell Studios. I actually have my cute sewing-genius-friend Katie working on assembling the bench cushion cover as we speak! Normally I would have attempted it, but I really wanted the cushion to be piped along the edges... and that is NOT a 'basic-sewer skill' ha! I'm still struggling with exactly what pillows I want in this space, so that's my next step. I'm getting really excited to pull all of this together! It's been a long-time coming, believe me. Hopefully everything will be done by next week so I can share! This blows my mind. Too awesome, too cute, and too fabulous. Can you send your dad over to my house? I live close by so it wouldn't be too hard ;) Seriously, so lucky and it looks gorgeous!! Can't wait to see the finished project! Beautiful job! I love the wall treatment that you decided on! Can't wait to see the rest. Looks so good!! What a amazing transformation. I love how the space now works for your house looking forward to seeing more. Love it so far! You guys never stop, and I'm jealous...wish I was that motivated to finish things. I have craft and remodel ADD. Ha. Very FUN! I've been waiting for the next installment. WOW! I"m definitely pinning this under 'future home'. 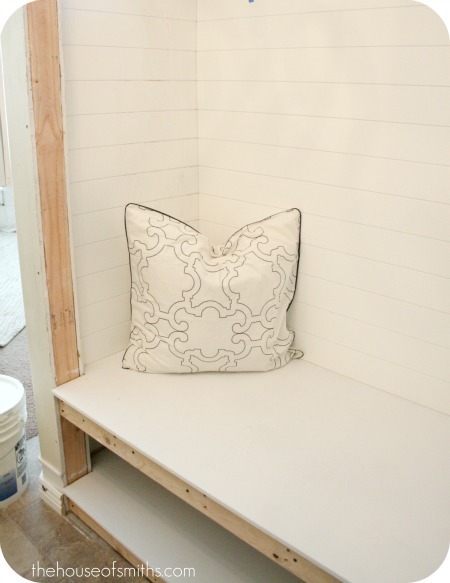 WE are in the process of getting bids for our new home so this little nook is a MUST HAVE in the mud room. Love this! Can you just come to Nashville and give me lots of ideas for my new home?!?!?!! HA! I can't wait! It's going to be awesome!!! 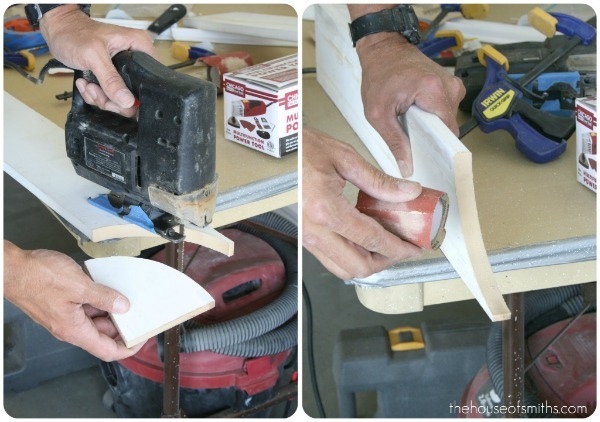 The horizontal beadboard is pure freakin' genius!!!!!!! I seriously have entry envy....looks AMAZING so far! Wow! I can't wait to see it all finished! WOW!!!! I wish I had someone handy to help me with all the crazy ideas I come up with!! I can't wait to see it finished! Wow LOVE it!! This would actually be a good idea for our front entryway closet... haha...just a question what gray paint did you use? I am currently looking for a nice gray for my living room! LOVE IT!!!! So creative!! I have a coat closet right by my front door!! Hummmm...I think you have just given me some inspiration! You're the BEST!! so fabulous. i can't wait to see the final result. I totally let out those same squeals of project happiness too. You are so lucky to have some awesome dad and hubby. I love how it is all turning out. Can't wait to see the finished product. Wow, I can't wait to see it all come together. Just curious how long ago did ya'll start this project. I love it so far! I used that same Dwell fabric for a headboard I made last year. I love it and it holds up well, you won't be disappointed. Can't wait to see the end result! looks gReat so far! can't wait until the final details! tfs! I love it Shelly! And it is great inspiration for me because I want to do something similar in our new house! We have to close in the front room to make an office for my hubby and I want to steal some of the space to make a mudroom like nook! Thanks for the ideas! oh my! this is so amazing!! i love love love love it!!!! wow what a difference already, looking good girl!! I really like what you're doing. I live in Florida and they don't have coat closets. I now wish I had one. Wow, I love it so far!!! Can't wait to the finished product!! I am in LOVE!!! I so wish I had a closet space like that near my front door.. I've been trying to get creative and think of how I could incorporate a spot like this is my house especially since I don't have a mudroom :( Loving how you installed the bead board horizontal instead of vertical! I would have my whole house wood plank walls if I could! Can't wait to see it totally decked out with decorative accents in the HouseofSmiths kind of way!!! LOVE IT! I so wish I had a closet space like that near my front door.. I've been trying to get creative and think of how I could incorporate a spot like this is my house especially since I don't have a mudroom :( Loving how you installed the bead board horizontal instead of vertical! I would have my whole house wood plank walls if I could! Can't wait to see it totally decked out with decorative accents in the HouseofSmiths kind of way!!! LOVE IT! Wow! This is awesome, can't wait to see it all pulled together. You have inspired me to start a few projects...what's sheen of paint do you usually use? Semi-gloss, flat, glossy? What's your "go-to" sheen for paint? Fabulous! So functional and so pretty. Excited to see it all decorated! Oh Shelley it looks absolutely stunning! Did you use the whole space that was the cupboard before, or is there still another cupboard space next to your nook? I love that you used the beadboard sideways, it has such a sweet vintage look done that way. Can't wait to see it finished! Excited to see it, your such an inspiration! Looks so good! 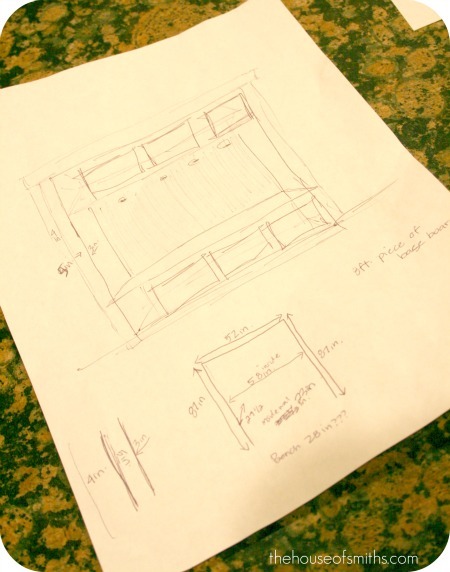 Love having handy men around to make projects come to life! I am excited to see the finished project..I know it is going to be fantastic as is everything you do! WOW! I am loving this!!! Can not wait to see the finished project! 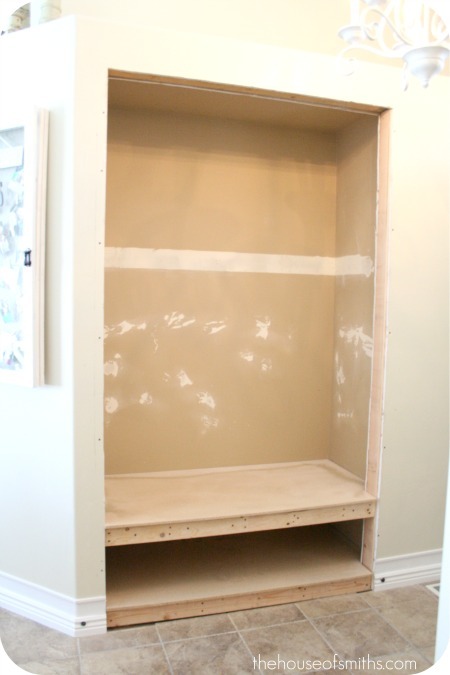 I cannot wait to see the finished closet. Your blog has given me the inspiration I have needed to tackle my house and make it mine. Thank you!! Love it! I've always wanted a nook...now I really want one! I love how it's coming together. Truly beautiful! Incredible transformation, I've enjoyed the progress views along with your notes. Our home has next to no storage space, you've given me some great ideas, thank you. Love it! Great work. We did a mud room and door casings (trim) too! Hope you check it out on acharmingnest.com. Gorgeous!! Can't wait to see it completely finished!! I can finally exhale! I've been holding my breath anxiously awaiting to see this . . . and it is so worth the wait! It's beautiful! Your Man is the MAN!! Looks amazing!! Can't wait to see all the fabulous touches you add!! Even your pet fly knows how great it is!! LoL! It looks so great, even without all the decorative stuff! Can you tell me what color your grey paint is? This is looking great! I love that you turned the beadboard on its side to make it look like paneling. It looks so charming and really fits well with the style of the rest of your house. This looks amazing! Can't wait to see the finished product. Where did you purchase the fabric? I looked on line and didn't see it. I would like to buy a little! Freaking amazing! Really. I'm blown away. And turning the board on it's side? ?...so genius! We are going to do beadboard in our 1/2 bath and now I just may be turning it on its side. Woo hoo! Wow! I can't wait for the final reveal! This is amazing. 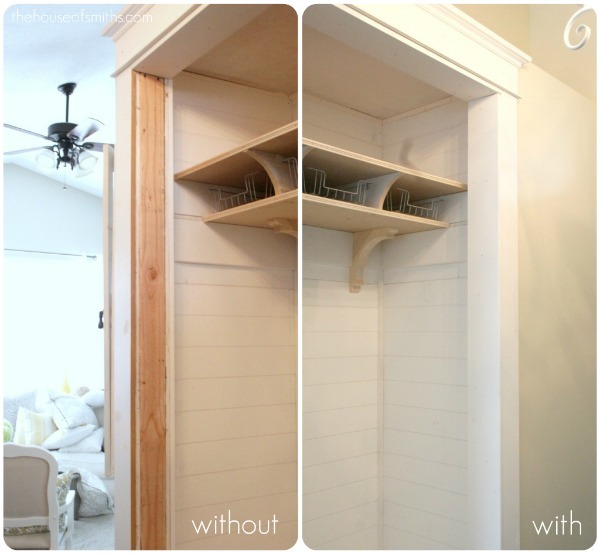 Now I wish I had an entryway closet I could dismantle and do this to. LOVING IT! just wondering if your Dad is available this weekend...I would love some built in storage in one of our rooms:) I Love the way everything is coming together!! The beadboard set in on its side is awesome! Oh I am loving this!! I can't wait to see the final product! Loving your choices--especially the beadboard horizontal. Your home is more modern and it goes perfectly. Sometimes, we have to let those hubbies help with the decorating and Carson's gray is wonderful. Can't wait to see it done! WOW What a transformation! Goodness me! I have been trying to figure out a 'drop' spot at my house, hopefully my hubs will be on board with the ideas I have about it. Wish it could be as big and nice as yours geez. You never cease to inspire!! Can't wait for the finish! Oh wow! Awesome, awesome, awesome!!! YOu know, every SINGLE time I come to your blog my husband curses under his breath at the TO TO list forming in my head.... THANKS for the inspiration! You two rock! Oh my LANTA! Seriously?! I LOVE this. Way to attack that space! This is going to look awesome AND be super functional...the perfect storm! 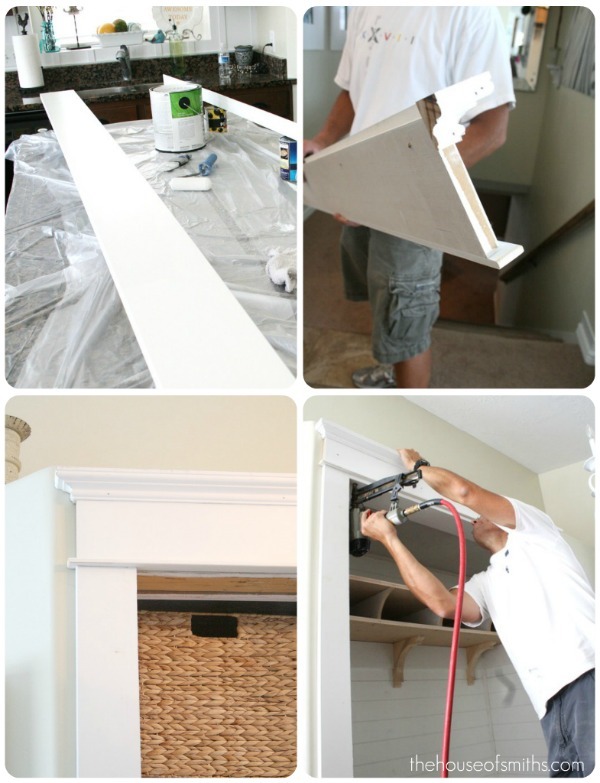 I love the idea of flipping the beadboard onto it's side. It's looking great. I can't wait to see the finished entry nook. Of course it will be amazing! looks SO great!!! love that pillow too! you've inspired BiG ideas! get ready sam!! WOW!!! Love it!!! so awesome!!! someone may have already asked this, but what color is the gray in the nook? i just had a bout of gray paint mishaps! i am on #3!!! errr...lighting and such....anyhow, love your house. i need a dad who lives closer and a husband with more time. really, how does your husband have the time to do so many projects? mine is lucky to be home before the kids go to sleep.....such is life. can't WAIT to see the reveal! LOVE! I love this project! I choose that same fabric to use in my daughter's room! I loooove the texture of it! Great Job! Just like everyone else- so curious about the wire baskets, fabric choices, mirror, etc. Swooning over the style. Just beautiful! Just like everyone else- wondering where did you get the wire baskets, the fabric, (even the white one under the grey circles), the mirror, etc. Swooning over the style. Just beautiful! my husband will surely want to strangle me, but i am wanting to do this to our awkward entryway closet now. you, miss, are a trouble-maker!! ;) it really is amazing..
the grey color? I'm wondering too! I have started this project, but I have run into a bump in the road. I have the grid made out for the bench and screwed in the wall but the front part will fall down if someone sits on it. How do I get the front part to stay up? Where can I get a picture of your finished project. I want to show my husband? The Lady with an idea. Awesome. such a smarter use of space. 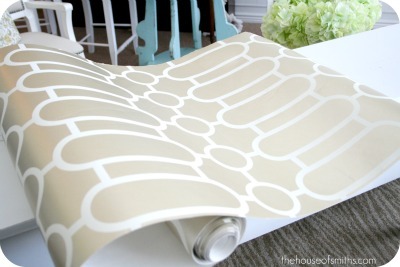 I love it, but I also really love that wallpaper that you didn't end up using. Where can I find some? This is beautiful! I'm hoping you can answer a question. I am trying to duplicate the top molding. You say it consists of only three pieces1. Flat molding turned (found that) 2. Wide board (found) 3. Brick molding. We can not find brick molding that looks like this. The brick molding we find is the same as you used in your board and batten for your bathroom. Can you tell me where you found this other brick molding? 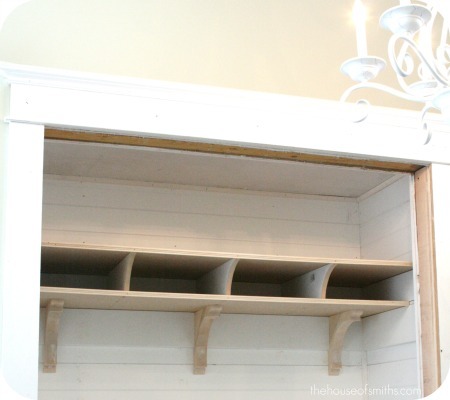 Would that "small piece of trim turned on its side" be "lattice" molding? I love the way the molding looks. When we moved into our house-a Levitt cape so already I'm behind the 8 ball- there were ugly clamshell moldings every where and flush luan doors (except for 1 original wood 2 panel which we modeled all the other doors after). We changed it to colonial casing but I want something different than the Pro-pack moldings that you see in every other house and this is what I am looking for and I am trying to replicate it. Is the small molding called Lattice molding? HD has it in 3 widths and it looks to be the same. Hi Shelley! Your nook looks fabulous! I stumbled upon your blog on Pinterest, of course! Could you tell me the hight of the bottom AND top shelf please? 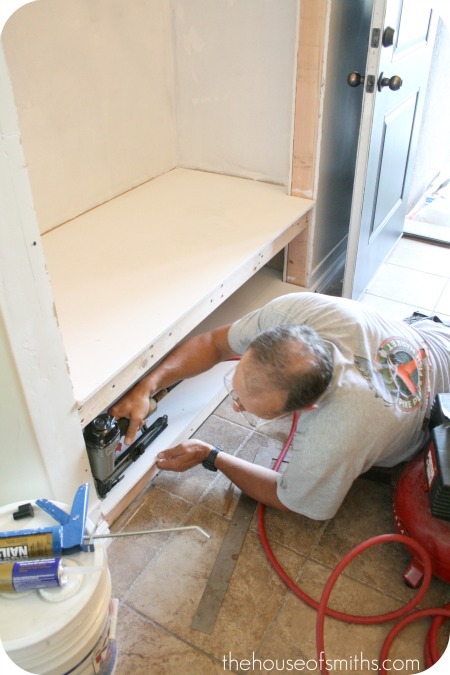 I plan on transforming a closet in our laundry room to give it more of a mudroom look and function, and yours is exactly what I imagined! Thanks! Hi Shelley! Your nook looks fabulous! I stumbled upon your blog on Pinterest, of course! Could you tell me the height of the top and bottom shelf please? I plan on transforming a coat closet in my laundry room to give it more of a mudroom look / function, and yours is exactly what I imagined! Thank you!